According to the stipulations of the Act No. 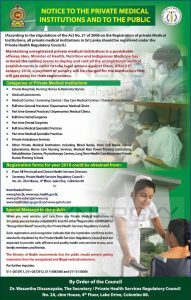 21 of 2006 on the Registration of private Medical Institutions, all private medical institutions in Sri Lanka should be registered under the Private Health Regulatory Council. Maintaining unregistered private medical institutions is a punishable offense. Hon. Minister of Health, Nutrition and Indigenous Medicine has ordered the raiding teams to deploy and raid all the unregistered medical establishments in order to take legal actions against them. After 31st January 2018, a payment of penalty will be charged for the institutions that will get delay for their registrations. Other Private Medical Institutions including Blood Banks, Stem Cell Banks, Dental Laboratories, Home Care Nursing Services, Medical Man Power Training Institutions, Rehabilitation Centres, Physiotherapy Centres, Long Term Health Care Home and Private Nurses Training School. From All Provincial and District Health Services Directors. When you seek services and care from any Private Medical Institutions in Sri Lanka, you are hereby requested to look for either ‘Registration Certificate’ or “Recognition Board” issued by the Private Health Services Regulatory Council. Such registration and recognition indicate that the institution conforms to the standards stipulated by the Private Health Services Regulatory Council and are expected to provide safe, efficient and quality health care services to you, your family members and friends. The Ministry of Health recommends that the public should prevent getting treatments from the unregistered and illegal medical institutions.